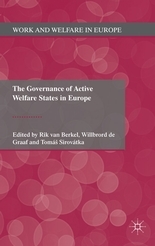 서명/저자 The governance of active welfare states in Europe / ed. by Rik van Berkel ; Willibrord de Graaf ; Toma？s？ Sirova？tka. 발행사항 New York : Palgrave Macmillan , 2011. During the last decade, many European countries introduced extensive reforms to the implementation structures through which income protection and activation programmes for the unemployed are implemented and delivered. These governance reforms include: the creation of markets for the provision of activation and employment services, the promotion of cooperation between benefit and employment agencies, processes of decentralizing policy making authority and the introduction of new public management in the public sector. This collection analyses and compares these reforms, exploring a relatively new research area. Covering nine European countries - the UK, France, Germany, Italy, the Netherlands, Switzerland, Czech Republic, Sweden and Finland - it focuses on the reform programmes themselves, and on what is known about their effects, arguing that governance structures are not without consequences for the social programmes they implement and deliver.